Published in March 2018, Strahan revealed the contents of this volume on his website in December 2017 and I’ve drawn on this, adding links to online versions where available (of course you rilly should buy the book). Daniel Abraham. “The Mocking Tower”. Originally published in ‘The Book of Swords’, ed Gardner Dozois (HarperCollins, 2017) an anthology of ‘fantasy tales in the grand tradition’ including a new GRR Martin Game of Thrones story. Charle Jane Anders. “Don’t Press Charges and I Won’t Sue”, a story in a ‘Global Dystopias’ issue of Boston Review, and here story is online on The Boston Review website (at the time of writing at least). Kelly Barnhill. “Probably Still the Chosen One”. Originally published online in/on Lightspeed Magazine and still online. R.S. Benedict. “My English Name”. Orginally published in The Magazine of Fantasy & Science Fiction. C.S.E. Cooney. “Though She Be But Little”. Originally published in/on Uncanny Magazine and still online. Samuel R. Delany. “The Hermit of Houston”. Originally published in The Magazine of Fantasy & Science Fiction. Greg Egan. “The Discrete Charm of the Turing Machine”. Originally published in Asimov’s Science Fiction. Max Gladstone. “Crispin’s Model”. Originally published in/on Tor.com and still online. Theodora Goss. “Come See the Living Dryad”. Originally published in/on Tor.com still online. Kathleen Kayembe. “The Faerie Tree”. Originally published in Lightspeed Magazine and still online. Mary Robinette Kowal. “The Worshipful Society of Glovers”. Originally published in/on Uncanny Magazine, and still online. Rich Larson. “An Evening with Severyn Grimes”. Originally published in Asimov’s Science Fiction. Also chosen by Neil Clarke in his take on the Year’s Best SF of 2017, where I read it, enjoyed it and reviewed it. Maureen McHugh. “Sidewalks”. Originally published in/on Omni and still online. Khaalidah Muhammad-Ali. “Concessions”. Originally published in/on Strange Horizons and still online . Linda Nagata. “The Martian Obelisk”. Originally published in/on Tor.com and still available. Also chosen by Neil Clarke in his take on the Year’s Best SF of 2017 where I read it, enjoyed it and reviewed it. Suzanne Palmer. “The Secret Life of Bots”. Originally published in Clarkesworld Magazine and still online. 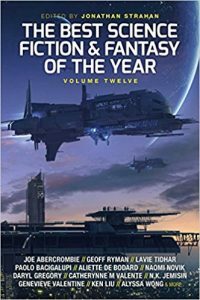 Also chosen by Neil Clarke in his take on the Year’s Best SF of 2017 where I read it, enjoyed it and reviewed it. Vina Jie-Min. “A Series of Steaks”. Originally published in/on Clarkesworld Magazine and still online. I read the story in it’s original appearance, enjoyed it and reviewed it. Kai Ashante Wilson. “The Lamentation of their Women”. Originally published in/on Tor.com and still online. Nick Wolven. “Confessions of a Con Girl”. Originally in Asimov’s Science Fiction. Caroline M. Yoachim. “Carnival Nine”. Originally published in Beneath Ceaseless Skies’ and still online.